Happiness Is a Mood Not a Destination: Sunday Social - Childhood Edition! 1. What were you like in middle school and high school? Middle school was actually better than high school. I had actual friends, whereas in high school they would be my friend and just laugh the minute I turned my back. You'd think it was opposite. I pretty much was your typical kid though. Glasses, braces (in middle school), way to much makeup to cover up the gross face, would probably burn every piece of clothing that I'd wear if I saw it today. People just picked on me for being different and used it to their advantage. It's actually said because I blocked out pretty much all of my high school years in memory. I was only trying to be who I was but because of them, I looked like a fool. 2. What were your favorite pastimes? As I've mentioned my two best friends and I used to make up concerts and perform them. I also loved just hanging out in the neighborhood. We draw a four square on the street and play for hours. We go next door and jump on the trampoline with the "boys" I also miss all our family gatherings. We still have them now but when I was younger, the fact that we were going to hang out with people I love was a big deal. It always made me so happy that I'd always get impatient waiting for the day. 3. What songs were you obsessed with? Anything Backstreet or O-Town. O-Town was awesome! Was that a popular band or was it just us? You could throw some Lance Bass in too if you want :) My grandmother turned me onto the band Boyzone also. I was in love with their songs! 5. Who was your celeb crush? Probably Nick Carter. 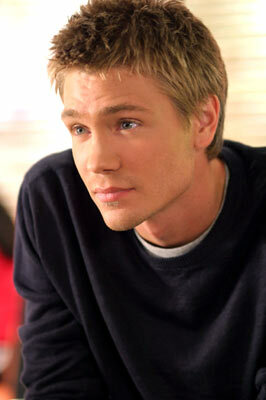 During the early 2000s when Gilmore Girls was on it was Chad Michael Murray. Alot of that was because the guy who I had a crush on in middle school and was my side kick through all 4 years looked exactly like him. 6. What was your favorite movie? All the girly movies. A Walk to Remember, Bring It On (my dad and uncle used to LOVE watching that with me, and no I'm not being sarcastic!). I cant even remember the names! I think I was probably about a generation before you - I remember the Backstreet Boys - but they hit when I was 19 - so I remember the guys doing the dance to "Everybody" at the bar to both be a bit sarcastic, but yet pick up women at the same time (because they totally knew EVERY MOVE).